Call it Google Wind. Or maybe, Google Power. Google Utilities? Whatever you want to call Google’s latest investment, one thing’s for sure. You can’t fault the company for not being forward thinking. Google and Good Energy are ponying up the cash to buy 37.5 percent of a proposed $5 billion dollar Atlantic wind farm backbone. The backbone is a series of cables, transformers, and relays that will connect 6000 megawatts of wind turbines on the mid-Atlantic continental shelf. 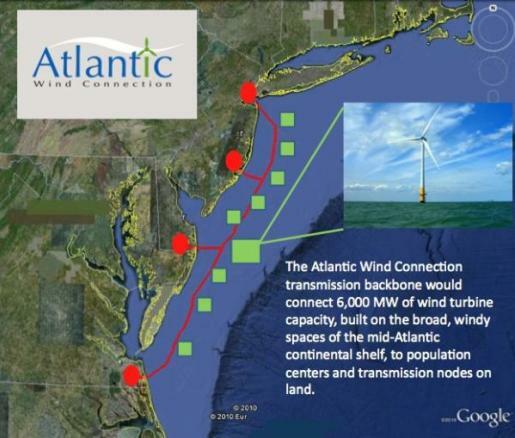 The wind farm network, dubbed the Atlantic Wind Connection, runs from New Jersey to Virginia. Combined, the various wind turbines can produce enough energy to power 1.9 million homes. This one line handles 60 percent of all wind energy produced in the United States, so it’s clear that this is serious business for Google. Now they just need to put solar panels on their turbines and start up a few biomass power plants, and they can officially launch Google Light And Power.